The Warriors won more than 80 percent of their combined regular-season and playoff games this season. And last season. And the season before. The narrative going into the 2016-17 Warriors season was how unfair it was that one of the best teams of all time added one of the best players of all time to become unstoppable. And after the Warriors posted the best winning percentage in NBA postseason history and their star acquisition won the NBA Finals MVP, the narrative coming out of the season is much the same, only louder. But easy to lose in this narrative is the simple fact that the Warriors probably didn’t need Kevin Durant for the team to be this good — or at least almost this good. While adding Durant has been a success, it didn’t end up breaking basketball any more than the Warriors had broken it already. But the Warriors’ mission isn’t just to win titles, it’s to guarantee them. And Durant is both icing and insurance policy — a guarantee that the Warriors will always have an MVP-caliber, one-man offense available. Though he makes them a little bit better in his own right, his main value comes from making what happened to them in the 2016 playoffs less likely. So what does make them so good? And, more broadly, is greatness a matter of refining all aspects of a discipline, or does it stem from being freakishly good at one thing? 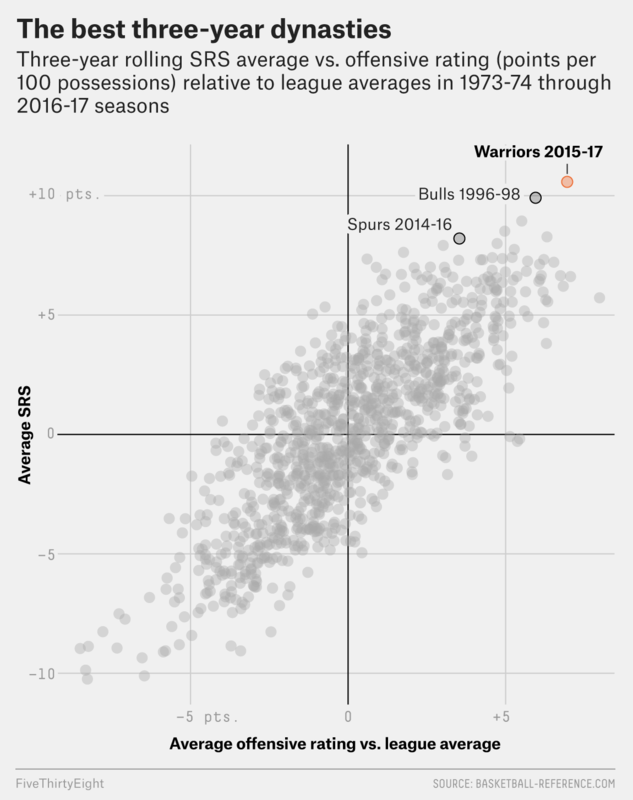 The Warriors are the first dynasty in the ball-tracking era,3 which gives us an opportunity to measure their greatness in ways that we couldn’t for dynasties past. 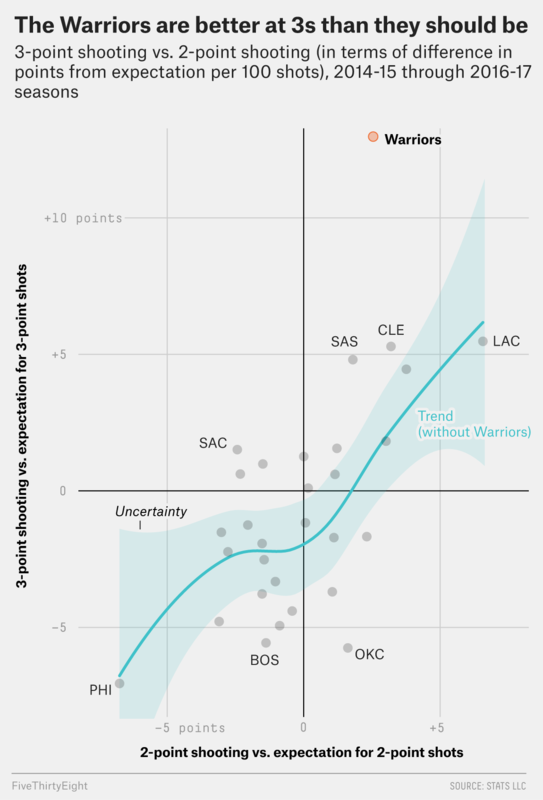 This, in turn, may also help answer the question of just how likely the Warriors are to regress to the mean. If their greatness is a confluence of factors, then there’s a whole lot of things that could go wrong to bring them back to earth. On the other hand, if their greatness is more about one thing, then maybe they can keep crushing the game indefinitely. While they’ve scored about 7 more points per 100 possessions than league average, they’ve also been 10.6 points better than their opponents overall — so about a third of their edge seems to come from something other than offensive efficiency. But it isn’t rare for teams with stronger-than-average offenses to also have stronger-than-average defenses. This is a bit counterintuitive — it seems like a great offensive team would be more likely to be weak on defense, since those are two very different skillsets and trade-offs must be made. And teams do, in fact, have to choose between more offense or more defense, so it’s significant that the relationship isn’t negative at all. To understand the sometimes complicated relationship between offense and defense, take the case of Dennis Rodman. Despite being known as a great defensive player, Rodman’s teams defended just about as well with or without him. And despite him being unable (or unwilling) to score himself, his teams were significantly more efficient on offense when he was on the court (even after accounting for his offensive rebounding). I suspect this is because having Rodman in the game allowed his teams to devote fewer resources to defending and rebounding, diverting those energies to offense instead. Similarly, having a highly efficient outside offense may allow a team to divert resources to the other end of the floor — not to mention that having your offensive players hang out more in the space between their opponents and their opponent’s basket can make their defensive job easier. This uses the SportsVu optical tracking data to judge offensive and defensive shooting versus league averages — it’s pretty similar to offensive and defensive ratings, but with rebounding and fouls taken out so we can concentrate on just shots taken and defended. Over their three-year run, the Warriors have been the best on both ends of the floor when it comes to both making and defending shots. Even so, their offensive prowess is particularly absurd. 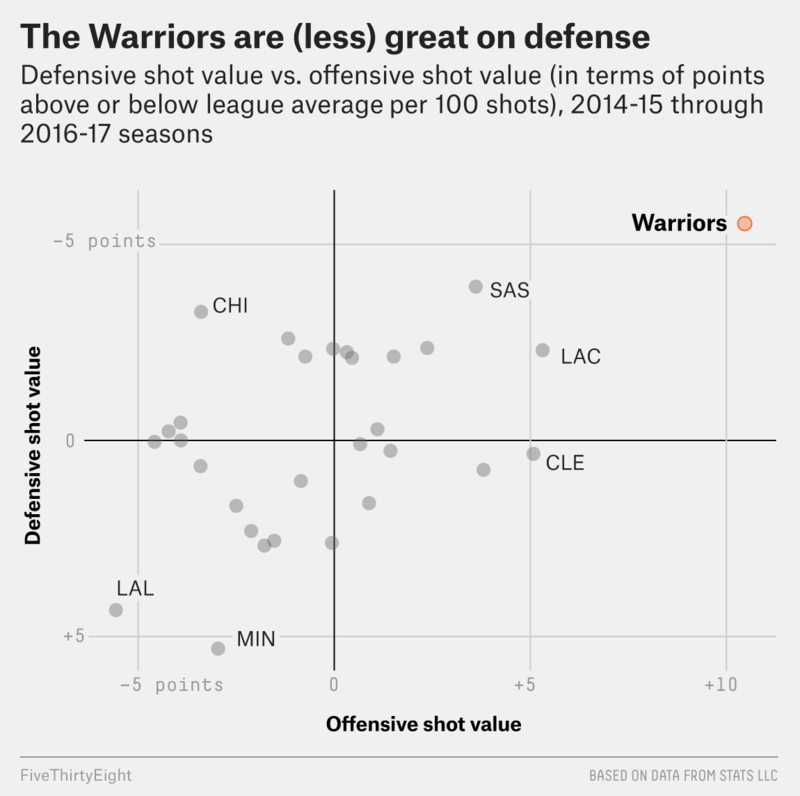 This shows that the Warriors appear to have a lot of players who are better at defense than they should be. Perhaps being free to focus on defense more than rebounding and offense helps. Perhaps they play bigger than their size in part because they’re typically in better position than you would expect from players on a more conventional offense whose goal is literally to get behind the other team. Perhaps opponents have to play offense with an extra eye on defense, or with more defenders than they would usually play. Also, having people like Stephen Curry and Durant as the offensive centerpieces may allow you to surround them with players who are more defense-oriented. Much like Rodman, someone like Draymond Green’s value may be fully realized precisely because he isn’t required to carry his offense. For a power forward, his responsibilities don’t include that much penetrating and collapsing the Warriors opponents’ defenses. Thus, despite being somewhat undersized for his position, Green has thrived — and indeed, may be one of the most valuable players in the league — in his current role. While the link between Golden State’s offense and defense is speculative, the relationship between their 3-point shooting and their other shooting is easier to track. The Warriors are respectable at shooting inside the arc, but have been more than twice as good as the next-best team at shooting 3s in this period. They’re so good at it that there’s an argument that they should be doing it even more often, and that Curry — still the best shooter the game has ever seen — should be doing it way more often. You can throw more defense at them, and teams have done so — as you see in the breakdown chart above, they’re pretty close to average in 3-point shot quality already. 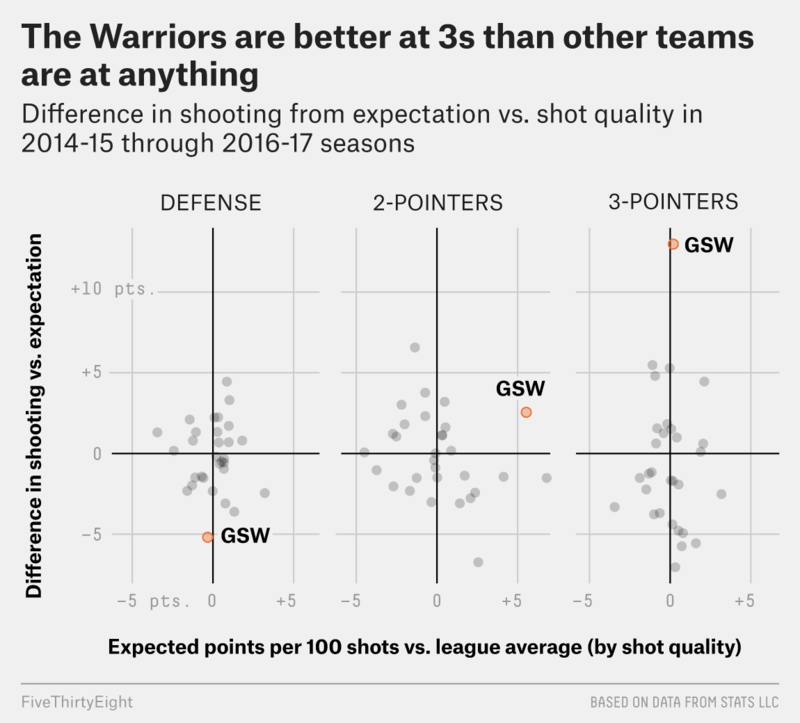 But the Warriors are still better at shooting 3s than any other team is at anything — 3s, 2s or defense. And diverting more and more resources toward keeping them from scoring 130+ points per game (as they would if they got off a typical Warriors dynasty-era 3 on every possession), comes at a price. Opponents are working so hard to stop the 3 that they’re almost certainly losing something from their offense or 2-point defense, which likely helps explain why the Warriors get so many open looks inside the arc. While Durant may be the story of the season, the Warriors’ dynasty was built and is still being propped up by Curry’s ability to throw the ball into the hoop from great distances. Provided he keeps being able to do that, expect Golden State to keep the game broken. The Bucks (1970-71 season) and Celtics (1985-86) have done it once each; the 76ers (1966-67, 1982-83), Lakers (1971-72, 1986-87), and Bulls (1995-96,1996-97) have done it twice each. The Warriors won 18 of the 22 games — 82 percent — that Durant didn’t play in this season. Tracking cameras have been installed in every NBA stadium since the 2013-14 season. The “more” is that I include one of STATS/SportsVu’s proprietary “shot difficulty” metrics as a variable in my model, though it isn’t weighted very heavily. And 19.5 points per 100 possessions when they were both playing.